Over the last few months, I've started to feel a bit suffocated by the amount of fabric I've accumulated. 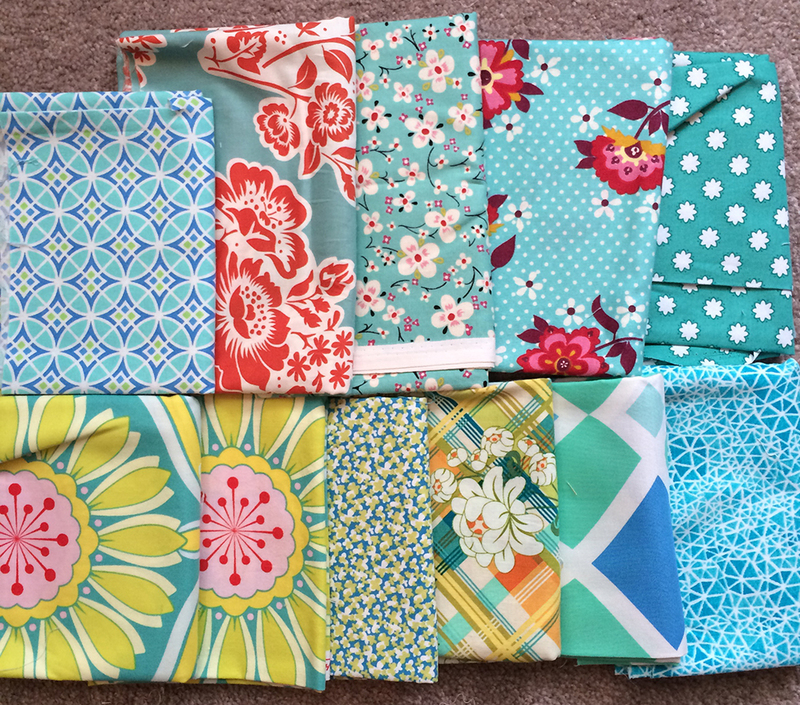 I love it all, and it's awesome to have options on hand when I'm working on a projects, but let's be honest - there is no way I am going to use all the fabric in my sewing room. On Monday I decided to lighten my load a bit and send some fabric to new homes. In some cases, the decisions were hard. I love so many of these prints. I decided to run my destash on Instagram. Instagram is a App on smartphones where you can take pictures and share them with others. There is a huge quilting community there, it's a lot of fun! 1. Fabric I had already used in several projects (I was ready to move on). or 2. Fabric that was same shade of color as several other fabrics I planned on keeping. or 3. Fabric that had been in my stash for 1+ years and I had never used. Once I had pulled everything, I made bundles. Some were sets of matching designs (Sketch or Mono Pez for example). Others were based on color. And a few were based on type of fabric, like linen. I tried to size the stacks to fit in a USPS Flat Rate Envelope. I ended up with over 40(!!) stacks. I went through and weighed all my stacks with a postal scale. I placed a notecard on top of each stack with a unique stack number, the weight, the approximate yardage based on weight (I used 6 ounces per yard), and a price that I thought was fair (and most importantly, would sell). Then I took a photo of each stack and posted the information on Instagram. I included the hashtag #thegreatfabricdestash on each post. The first person to leave a comment with their email address (or "ME!") got the stack. Katie suggested I make a spreadsheet to track everything and that was the best advice. I opened Excel and had a column for: Stack Number, Price, Description, Winner Email, Winner Instagram Id, Invoice Number, Paid Flag, and Shipped Flag. This made it so much easier to track 40+ sales and packages. Once the sale was over, I used PayPal's invoicing tool to send invoices to all my winners. It's very easy to use, just keep in mind you do have to pay PayPal fees. I also used PayPal to print shipping labels. I shipped everything USPS Priority Mail. I'm not going to lie. It was tough. (Mentally and physically - this process took me an entire day). But it was also surprisingly therapeutic and freeing. I feel like a huge weight has been lifted off my shoulders. And don't worry, I still have a ton of fabric. But less than I did a week ago.